parks in the United States. 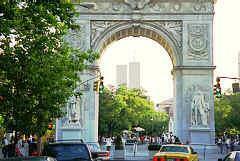 It is nine acres of park at the foot of Fifth Avenue. The park surrounding Greenwich Village has a great deal of historic value, charming town homes, and alleyways. You can find dog walkers, chess players, fortune tellers, jugglers and stand up comics at all hours of the day and night. Marked in history, The Village incorporates two very different neighborhoods; The East Village and The West Village. The East Village is bordered by the East River on the east side, Broadway on the west side, Houston Street on the south side and 14th street on the north. And the West Village has the same north and south borders but goes from Broadway on the east side to the Hudson River on the west side. The East Village entertains young and old alike with experimental music, clubs and theaters, and cutting edge fashions. The West Village is a bit more sophisticated and domestically diverse neighborhood. Fall in the Village is always extraordinary! The East Village has been home to the Beat generation of the 1950's, hippies in the 1960's, and punks in the late 1970's and 1980's. Tree-lined and clean, the unique shops and restaurants in the area abound. The East Village includes the primary campus for New York University (NYU), The New School,Yeshiva University's Benjamin N. Cardozo School of Law and Cooper Union, a school that holds many interesting public lectures and exhibits, was established in 1859 just in time for Abraham Lincoln to make a campaign speech in its auditorium. Foodies take note, this neighborhood reputedly contains the most varied assortment of ethnic restaurants in New York City, from the crush of Indian eateries on the south side of East Sixth Street (sometimes called "Little Bombay") to McSorley's Old Ale House, a pub that seems unchanged since it first opened in 1854. Nearby, in what was once the home of the Astor Library, the restored Public Theater has been the opening venue for many now-famous plays. And then there's the West Village, a more expensive, slightly older and more sophisticated neighborhood than the East Village. Here you'll find great shops, restaurants, theaters, clubs and bars. While many consider the West Village to be gay, and in fact there is a street here named Gay Street, it offers a mixed crowd. Greenwich Village was once simply marshland. The 16th century Native Americans called it Sapokanikan or Tobacco Field. The land was turned into pasture by the Dutch Settlers in 1630 and in turn named the area Noortwyck. The English conquered the Dutch Settlement of New Amsterdam in 1664 and Greenwich Village was developed into a hamlet separate from Manhattan. It came into its own and was referred to as Grin´wich in 1712 in the historic records of the Common Council. The terrible yellow fever epidemic that hit New York in 1822 did not reach Greenwich Village and many families fled there and decided to stay. Today the residents of Greenwich Village understand the significance of their surroundings and take great pride in the history. Many Off Broadway and Off Off Broadway hits get there start here. Although the prices for homes are dramatically higher today and most of the starving artists can not afford to live here, they visit often to become inspired and remember the roots of their culture. The Village Vanguard hosts some of the biggest names in jazz on a regular basis. Comedy clubs dot the Village as well, including The Boston and Comedy Cellar, where many American stand-up comedians got their start. Each year on October 31, it is home to New York's Village Halloween Parade, a mile-long that draws an audience of two million from throughout the region, The parade is listed in the book, 100 Things to Do Before You Die and was chosen as the Best Event in the World for October 31st by Festivals International.There is still a wide variety of people living in Greenwich Village. The event brings nearly 60 million into the city´s economy annually. It is the largest public Halloween event in the United States, and the country's only major night parade. It has been called "New York's Carnival." The delighted and high-spirited throngs include everyone from the smallest children dressed in the simplest homemade or store-bought costumes on up to adults bedecked in the most elaborate and ingenious guises and disguises that professional and amateur costume designers and makeup artists can conceive and create with a year's notice. Among the parade's signature features are its pageant sized puppets, giant rod puppets "articulated" by teams of puppeteers and its open participation to anyone in a costume who wishes to march. Several publications have offices in the Village, most notably the newsweekly The Village Voice. The Voice was launched by Dan Wolf, Ed Fancher and Norman Mailer on October 26, 1955, from a two-bedroom apartment in Greenwich Village, its initial coverage area, expanding to other parts of the city by the 1960's. The offices in the 1960's were located at Sheridan Square; they are now at Cooper Square in the East Village. The Village Alliance is another publication and website not-for-profit Business Improvement District located in the heart of Greenwich Village one block north of Washington Square Park on 8th Street & extending eastward to Second Avenue & St Marks Place. Over the years, the 12 blocks included in the Village Alliance have been home to some of America's most creative minds and artists. Jefferson Branch Public Library - has a vast collection on Greenwich Village History as well as digital collections, classes, events, and general reference guides. Schools in Greenwich Village have their own website for you to browse.The East Village entertains young and old alike with experimental music, clubs and theaters, and cutting edge fashions. The West Village is a bit more sophisticated and domestically diverse neighborhood. Fall in the Village is always extraordinary! Washington News and MacDougal Alley are quiet cobblestone lanes right off the square. Legendary streets such as McDougal, Astor Place, and Bleecker Street are lined with super-hip boutiques, delis displaying esoteric beers from around the globe, and cafes and restaurants of all kinds.